It is no secret that Cuba, for many years a no-go destination for most Americans, is rife with propaganda. Much of it is anti-American, or anti-Capitalist, and an equal amount of it is pro-Castro, or pro-revolution. Throughout my travels to China, Russia, the Ukraine, and Syria, I have always found a certain kitschiness in images of Mother Russia, of the working man sowing fields “for the people,” of that great hammer-and-sickle, of the Fearless Leader. Even Mexico has its share of anti-colonial propaganda, from urban graffiti to the murals of Diego Rivera and David Alfaro Siqueiros. Some of these images are impressive, artistically-speaking, while others make me laugh. The key, I think, is to take them with a considerable grain of salt. 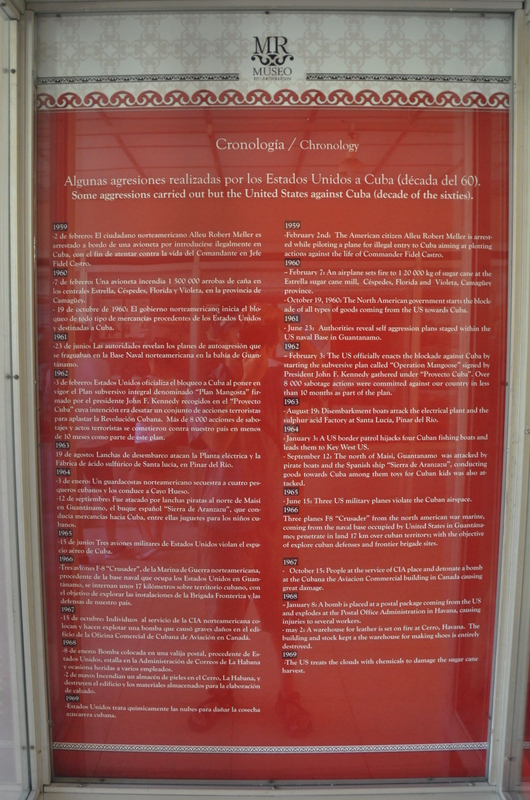 Here is a gallery of Cuban propaganda as photographed by yours truly. They are in no way a reflection of my political beliefs; I don’t condone the violence that accompanied Cuba’s revolution. Considering the omnipresence of his likeness throughout Cuba (and on t-shirts worn by seemingly every male tourist to the island), it seems appropriate to begin this gallery with a few words on Che. Ernesto “Che” Guevara was born in Argentina but later acquired Cuban citizenship and became something of a legend as he essentially led Fidel Castro’s revolution on the front lines. Portraits of Che can be found in every museum and government building throughout Cuba. 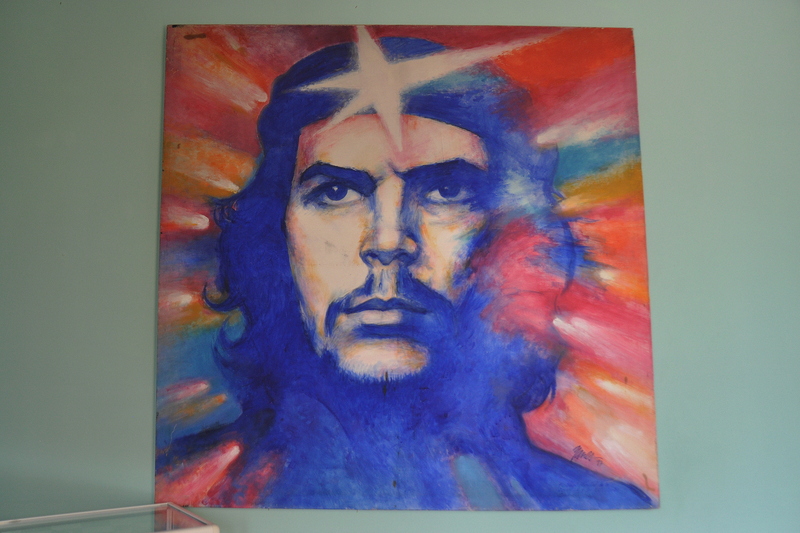 The painting above hangs in a Havana house in which Che once lived. 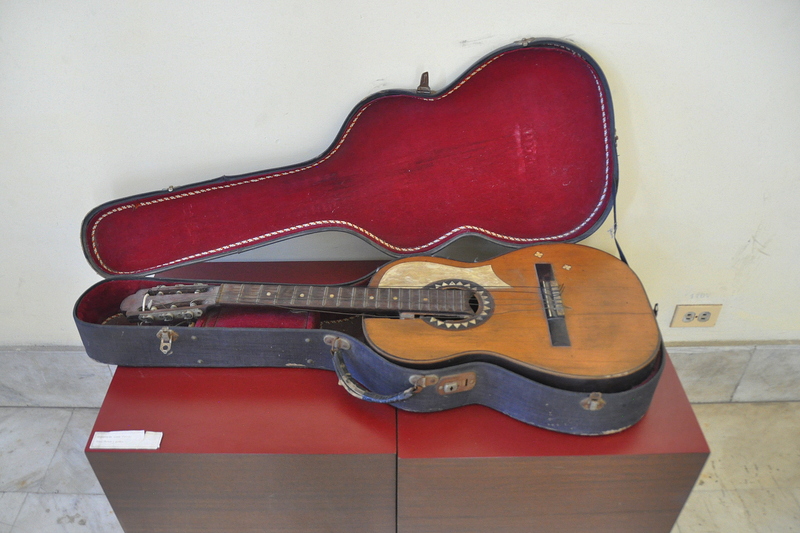 Speaking of Che, this guitar belonged to Coco Peredo, a Bolivian revolutionary who fought alongside Guevara during the final weeks of Che’s life. Considering that it didn’t belong to Che himself, I couldn’t believe the amount of metaphorical drooling over this item by Cuban visitors to the Museo de la Revolución, where it is housed. It is just a guitar! 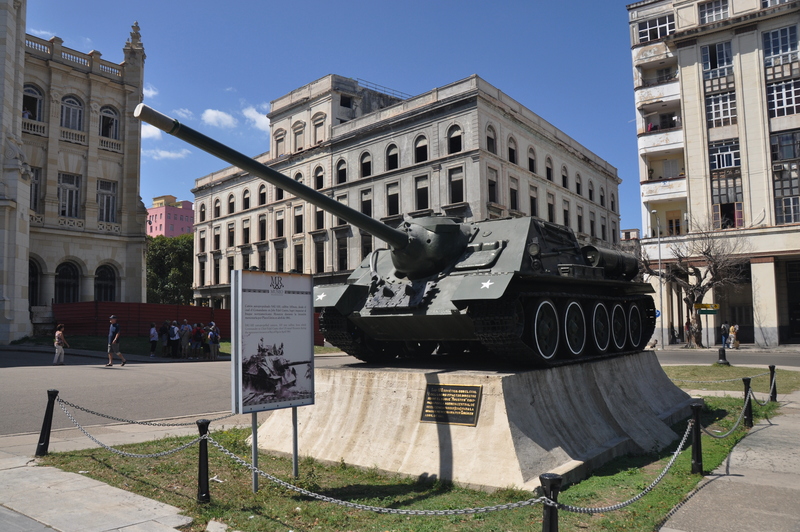 This SAU-100 tank, which now sits in front of the Revolution Museum, was once commanded by Fidel Castro. I would love to see pictures of that; I’m sure they are more impressive than those ill-advised photos of U.S. Democratic Party presidential candidate Michael Dukakis posing inside in a tank for Campaign ’88. Ugh. You needn’t go any farther to get your fill of propaganda than to Havana’s massive Plaza de la Revolución. 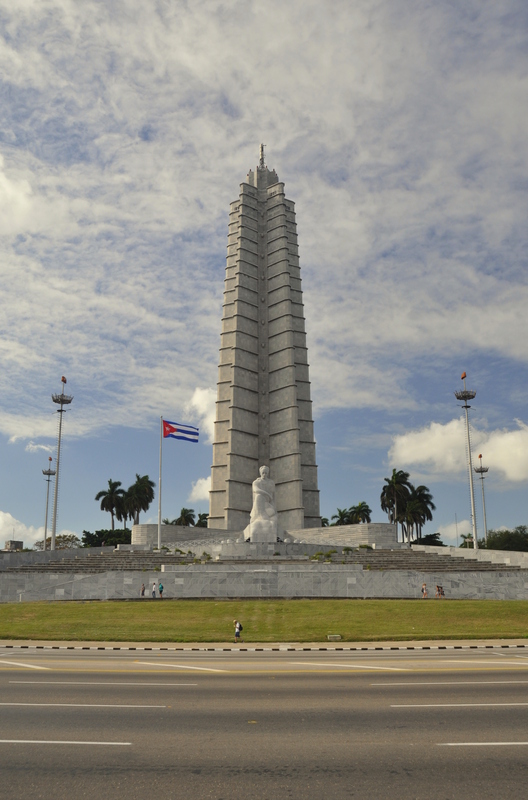 Here, a marble statue of José Martí sits gloriously in front of a 138.5-meter monument built in his honor. Both pro-Castro and anti-Castro Cubans revere Martí, who preceded Castro by 100 years in fighting for a true cause…independence from Spain in Martí’s case. The picture above better demonstrates the sheer size of the plaza. 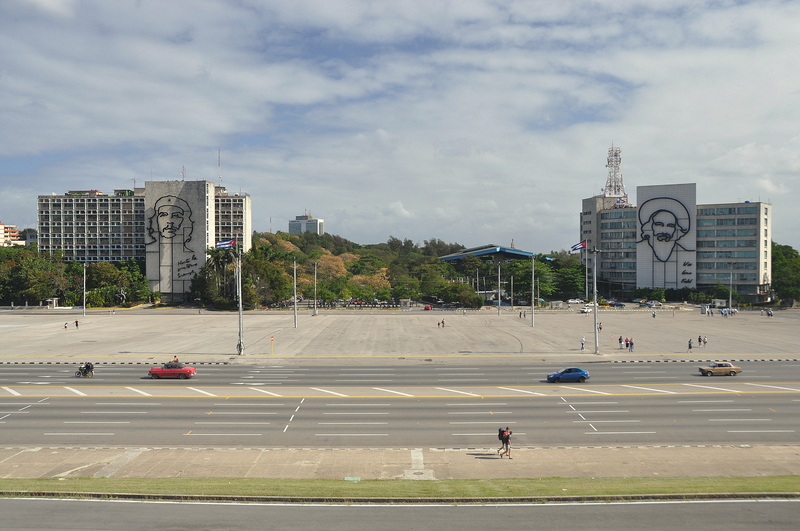 The images of Che and Camilo Cienfuegos, Cuba’s other revolutionary hero, adorn the two government buildings in the square. “Always onward towards victory,” says Che, while Cienfuegos insists, “You’re doing well, Fidel.” Yeah…not so much. 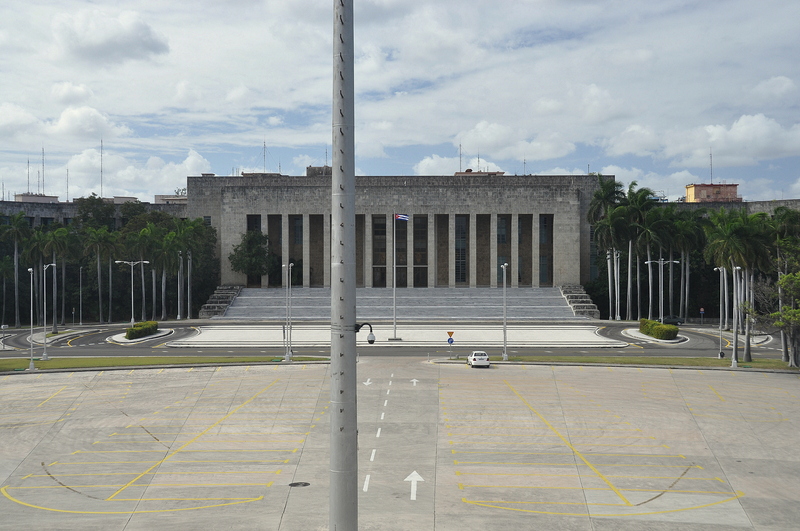 The imposing Communist Party Headquarters, behind the José Martí Monument. In hindsight, I probably wasn’t supposed to take this picture…although the complex looks strangely empty. 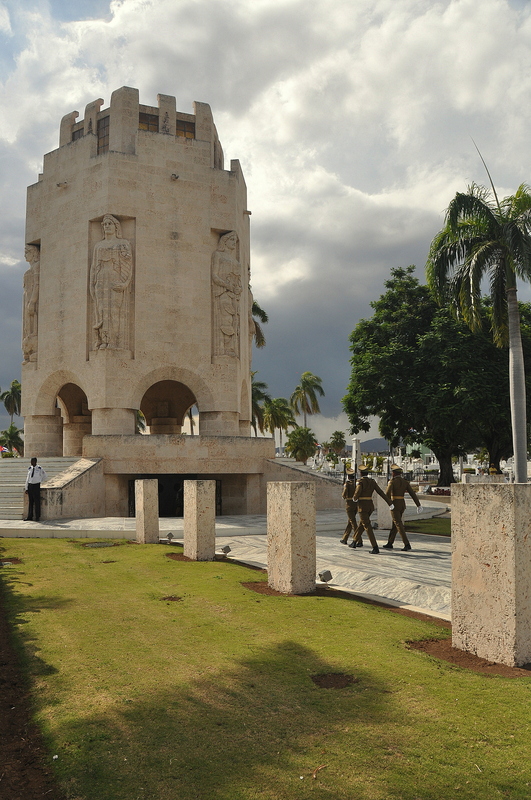 Martí is buried in Santiago’s Cementerio Santa Ifigenia, which is basically Cuba’s equivalent to Washington, D.C.’s Arlington. Fidel Castro is buried here, too, but the pomp and circumstance surrounding Martí, including a very elaborate changing of the guard every hour, as photographed above, makes Castro’s grave – a simple boulder – almost an afterthought. The U.S. and Cuba have come dangerously close to all-out war more times than most people realize. 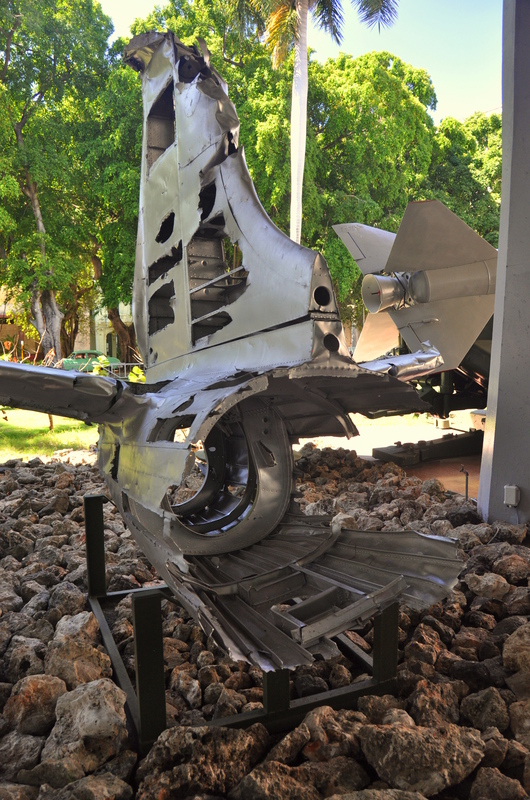 A courtyard near the Revolution Museum has, on display, this fuselage from a B-26 bomber belonging to the Americans and shot down over Cuba during the Bay of Pigs Invasion. Also (proudly?) 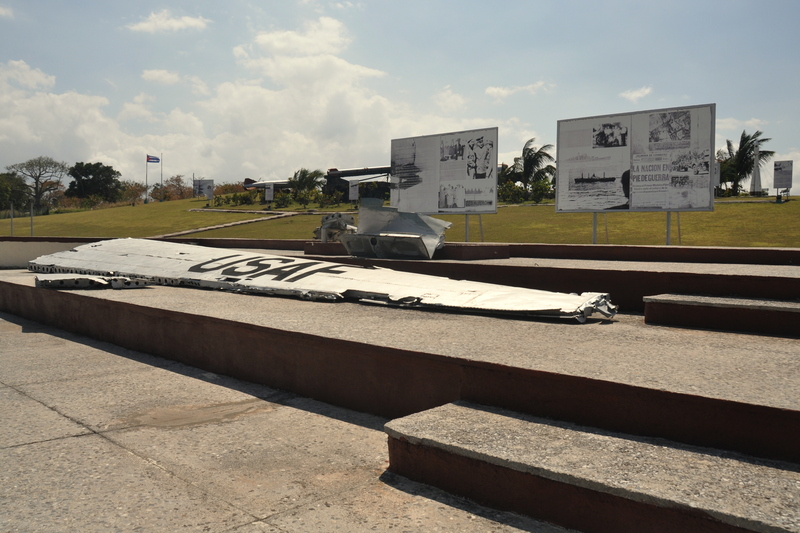 on display near the Castillo del Morro is this wing from a U.S. Air Force plane that was shot down while flying low over Cuba to snap covert photos of missile hordes during the Cuban Missile Crisis (known locally as “Los Misiles del Incidente de Octubre“). If you grew up in the U.S., you probably remember learning in school about the U-2 spy plane that was shot down by the Russians while flying through Soviet airspace. 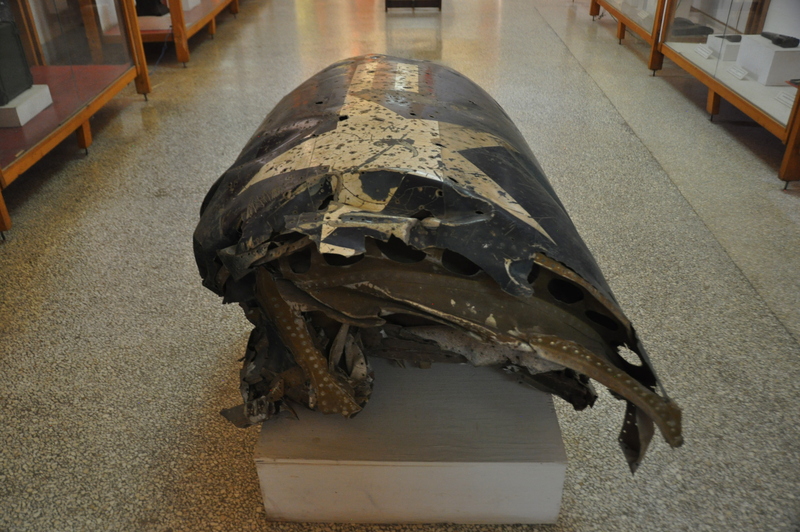 The plane’s shooting nearly led to war…and its bullet-strafed fuselage somehow ended up in a museum in sleepy Trinidad, a colonial town in central Cuba. 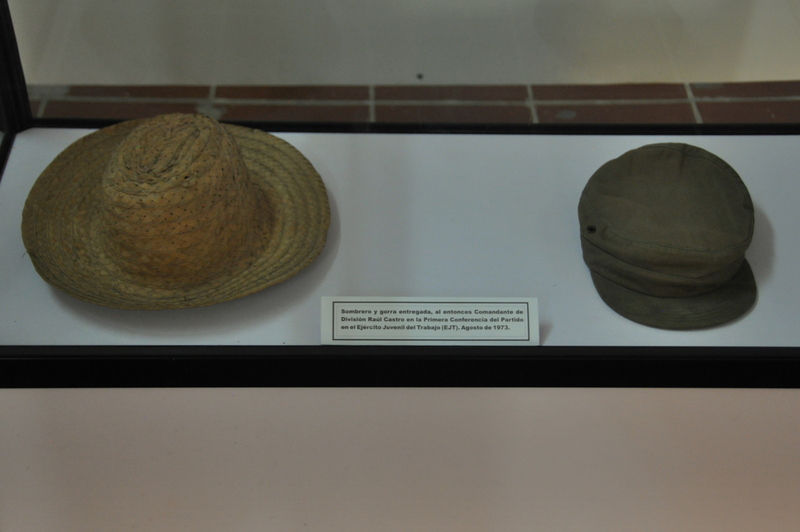 Camilo Cienfuegos’s sombrero and Che Guevara’s beret. A group of Cuban soldiers, on leave, fawned over the contents of this display case for what seemed like an hour. A bit hard to read, but here is a list of (alleged) acts of aggression by the U.S. towards Cuba. I haven’t done much research to verify the accuracy of these claims…but the cynic in me believes most of them. 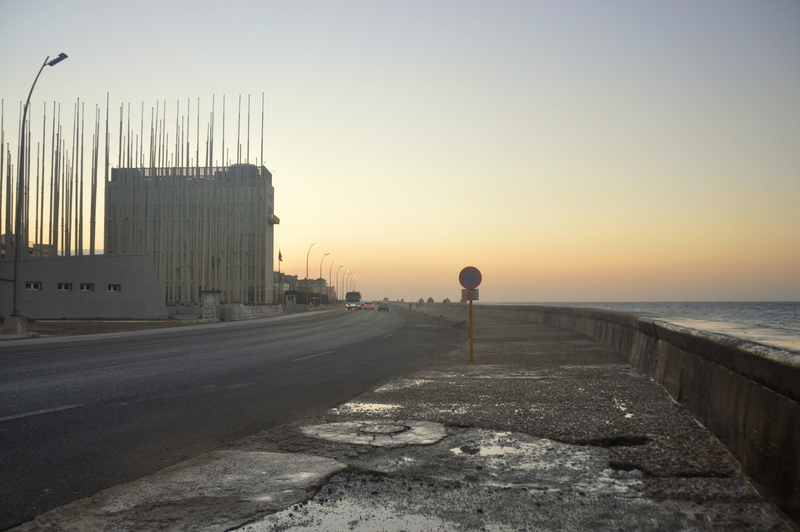 The U.S. Embassy building, above, sits directly across the malecón from the Gulf of Mexico, and is a regular target of propaganda in the form of anti-capitalist radio broadcasts. The poles in front of the building, which look like a seagull’s paradise, were erected by embassy staff to block the messages. 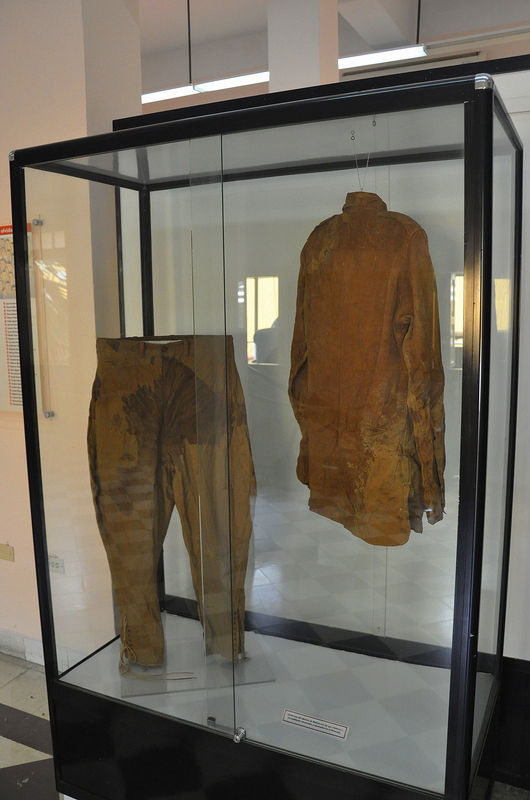 Some anti-Batista propaganda: the blood-stained clothes of a revolutionary who was tortured by Batista’s soldiers following the ill-fated attack on the Cuartel Moncada (barracks) by Fidel Castro in Santiago de Cuba on July 26, 1953. 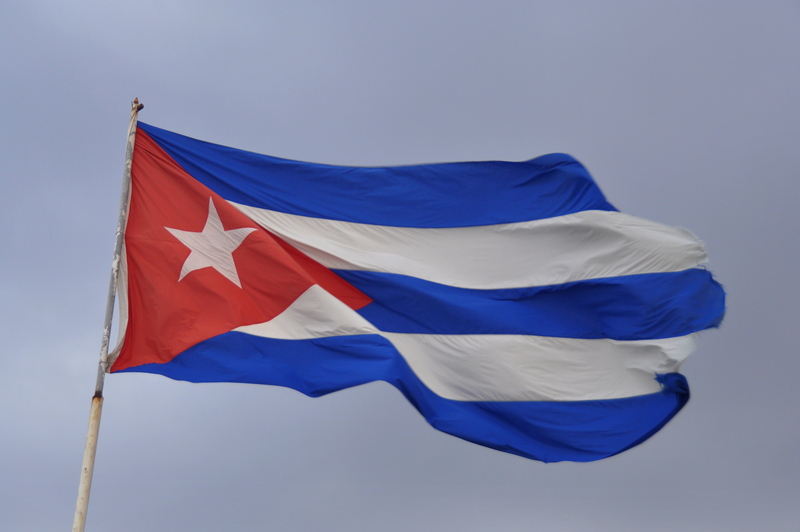 The attack failed, but some of the rebels responsible were brutally tortured and executed…acts of torture that turned public sentiment from Batista and in favor of Castro. “History will absolve me,” he said during his trial. We won’t know for sure until Fidel’s brother, Raul, steps down at the end of 2018 – and possibly not for another 10 or 20 years – whether Fidel truly was absolved. Shell damage to the Cuartel Moncada. Batista’s men filled in and spackled over the holes to suggest that nothing bad had happened here. 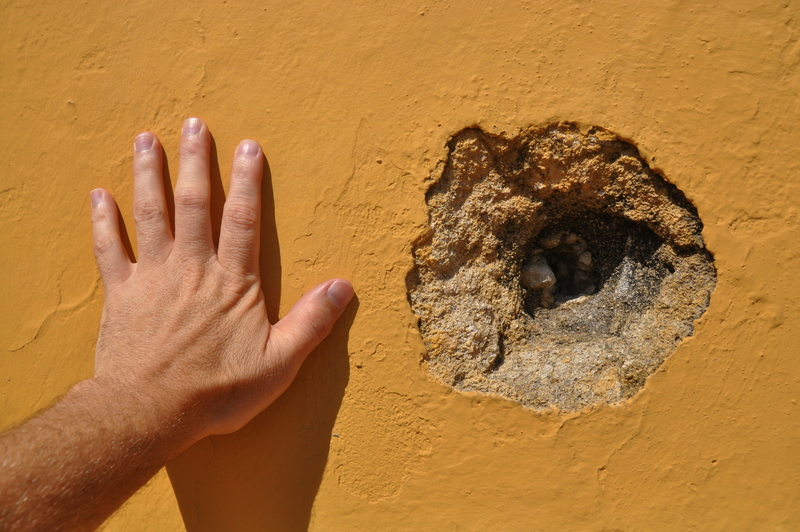 After Batista fled and Castro took over, his men “recreated” the original holes. Ignacio Agramonte, another Cuban independence hero, fought against Spain and was killed by a stray bullet at just 32 years of age. 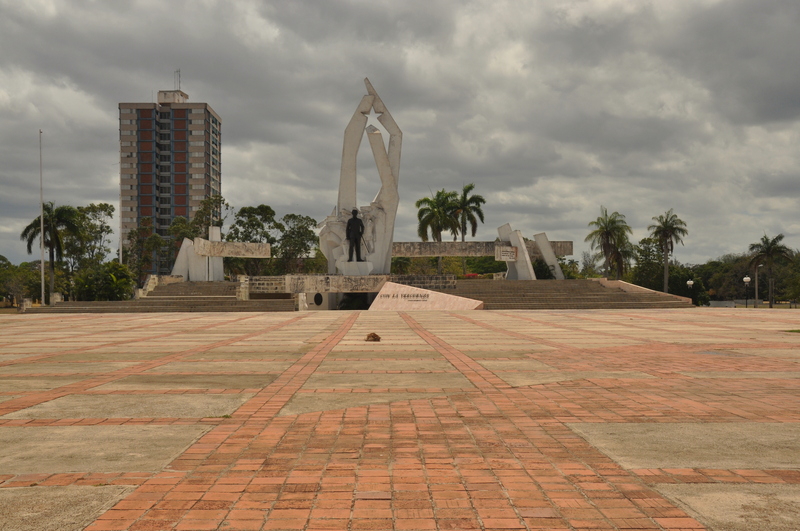 The Plaza de la Revolución in Camagüey has a statue in his honor, similar to the Martí statue in Havana’s plaza. The Camagüey plaza, however, was completely deserted. The amiable relationship between Fidel Castro and Venezuela’s Hugo Chavez was something of a platonic Latin American love story. 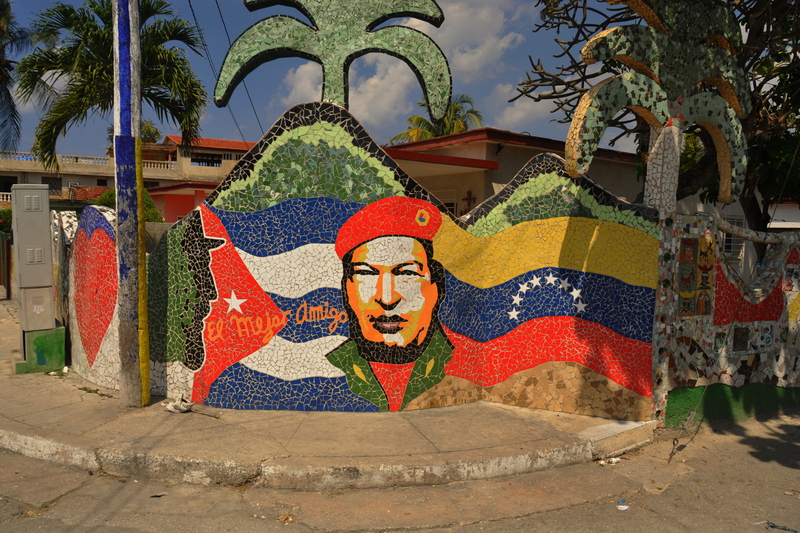 “The best friend” is how Chavez is described on this colorful mosaic tile wall in Fusterlandia, a ceramist’s dreamscape in northwestern Havana. 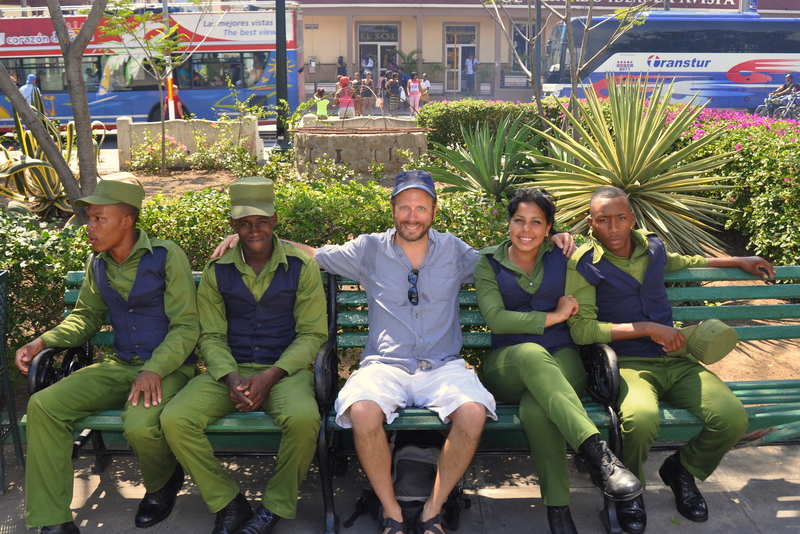 Regardless of the contents of Cuba’s propaganda, my trip there was filled with almost universally positive memories. The people, including these soldiers, were welcoming, curious, and hopeful…as I am regarding future U.S.-Cuba relations. Interesting post man! I found all the propaganda fascinating, it’s impossible to avoid of course. 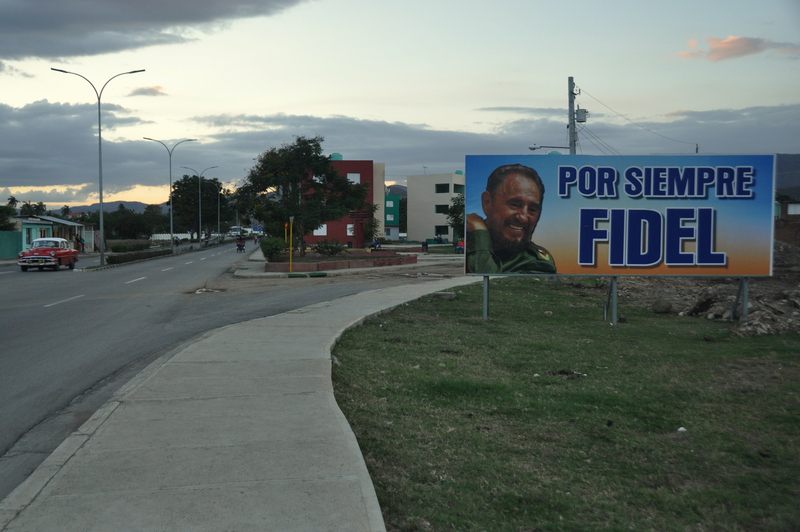 A photo essay I did of photos of communist slogans in Cuba is my most visited post, thanks to google searches. Would love to go to Russia and eastern Europe to explore communist history there. Thanks, buddy! I just checked out your post and gave it a like. Good stuff.